New York has no shortage of tours – interactive, museum, haunted. However, the Upper East Side is home to a few particularly unique tours – ones you probably don’t know about. Here are a few alternative tours you’ll find near our Luxury New York City condominiums at 40 East End. This tour helps visitors view art through a different lens: Shady Ladies offers unique women’s art history tours at the Metropolitan Museum of Art. The tours tell the stories of courtesans, royal mistresses, and other powerful women depicted in the Met’s art. These two-hour tours, dubbed “Shady Ladies” and “Nasty Women” offer a female-focus of many famous works. They also offer a “Wild and Weird” tour that takes an unprecedented look at underrated works at the Met, and a French Revolution tour featuring the decadent era of Marie-Antoinette. Join experienced photographers as they shoot the lakes, bridges and man-made attractions in the park. This tour will get you one of the most coveted shots of the city: the classic view of the New York City skyline from Central Park. This tour takes place daily at 10 a.m.
Citifari Photography Tours also offers a tour of New York’s landmarks, which includes the UN headquarters, the Empire State Building, and Grand Central Terminal, among others, a “New York by Night” tour, and a chance to shoot the iconic SoHo neighborhood. For the history buff wanting something off the beaten path, look no further than Mount Vernon Hotel Museum and Gardens. This historic stone carriage house offers a deep dive into 19th-century New York City through a series of tours. “Murder Mystery” is a team-building game in which groups work to solve a mysterious murder that took place at the hotel years ago. This tour brings together history and problem-solving for an afternoon of fun and learning. The museum’s other programs include a social history tour complete with an interactive tour of the Ladies’ Parlor, a 19th century food tour, and a literary-themed tour on the rise of American writers in the 1800s. You don’t have to go downtown for great Manhattan tours. The Upper East Side has plenty to choose from. Absorb the history of the area just blocks from our luxury New York City condominiums, and you’ll develop a greater appreciation for your neighborhood. Spring is here, and that means that the city’s flowers will soon bloom. The Conservatory Garden at the north end of Central Park is one of the best places in the neighborhood to see the seasonal explosion of color near our East Side condos. This six-acre professionally designed garden is accessed through the Vanderbilt Gate on Fifth Avenue, between 104th and 105th streets. The impressive wrought-iron entrance gate will take you back to 19th century Paris – when and where it was made. The gardens themselves exemplify the spirit of New York City’s Upper East Side: elegant and not surprisingly full of natural beauty. 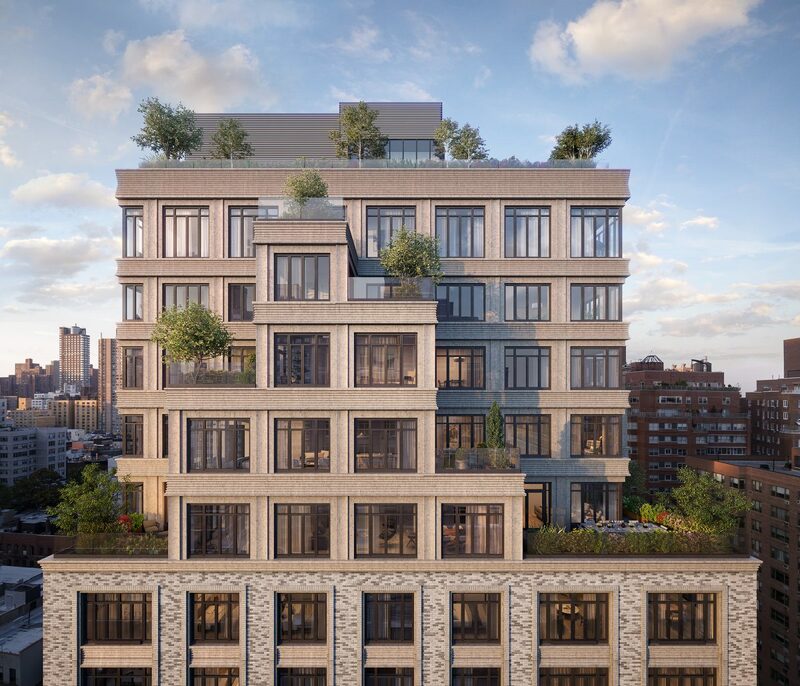 This is a fantastic cost-free New York activity, and is located just two miles northwest of 40 East End’s luxury New York condominiums. The Conservatory Garden is comprised of three separate gardens in three different styles – Italian, French and English. Each garden is distinct and equally impressive. The Italian garden is located at the center, surrounded by thick yew hedges. The garden’s pathways feature soft pink blooms and white crab apple trees. Follow these to the 12-foot fountain, framed by intricate tiered hedges. Continue your journey down a path to a wooden shelter covered by 100-year-old vines. Much of the French garden is seasonal in nature, so you’ll see something different all the time. It features spring tulips, fall chrysanthemums and Japanese holly. At the center is a German-made fountain called Three Dancing Maidens. The south end of the garden plays hosts to an intimate English-style plot, which surrounds a third structure: the Frances Hodgson Burnett Memorial Fountain, a nod to her famous work, The Secret Garden. The sculpture is set among trees, perennial shrubs and plants, five beds for seasonal bulbs and a bank of woodland plants. The garden offers a tranquil escape from the bustling streets of the city. The Conservatory Garden is a designated quiet zone, which means big events, music and “outdoor voices” are prohibited. Occasionally, you’ll see intimate weddings taking place among the intricate gardens. The garden is open year-round, with extended hours in the spring and summer. In April, you can visit from 8 a.m. to 7 p.m. May through August the garden is open from 8 a.m. to 8 p.m. daily. Blocks from 40 East End’s luxury New York condominiums, the Conservatory Garden is one of the sights that complete this sought-after neighborhood. 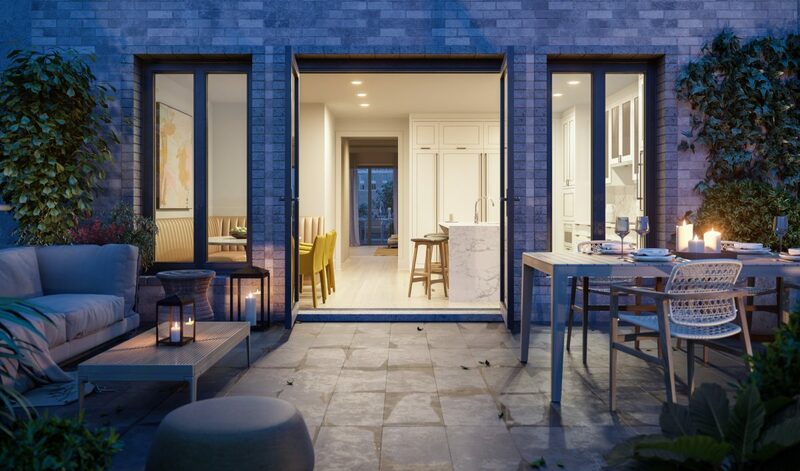 To find out more about our East Side condos near the Conservatory Garden, get in touch with us today. As the snow melts, the spring energy begins to inspire New Yorkers to get outside. While Upper East Side condos may have provided the perfect holiday den for the last three months, the budding trees signal that it’s time to explore. Here are a few activities to enjoy this spring near our Upper East Side condos. Nothings says “spring” like Central Park. Green grass, flowers, trees beginning to sprout leaves, and air warm enough to have a picnic – Central Park is a hub of activity in the warmer months. Skip the gym and get some exercise in Central Park. Alternatively, enjoy Central Park events and activities, like Shakespeare in the Park, concerts and more. Since the park is just 10 blocks from 40 East End’s luxury Manhattan condominiums, be sure to add some of its spring and summer events to your social calendar. A journey to the local farmer’s market is a wonderful way to pass a sunny Saturday morning. While many are, in fact, open year-round, spring to fall is when these marketplaces are buzzing. Once spring arrives, visiting a weekly farmer’s market shop can be a great way to get outside, eat healthier and see the city in a different light. 82nd Street Greenmarket is open Saturdays from 9 a.m. to 2:30 p.m. year-round, and is located less than two blocks from our Upper East Side condos. This market has everything from wild-caught seafood to goat milk to fresh produce. Others neighborhood markets include East 67th Street and 79th Street markets, both excellent resources for local products. Put away the red wine and take out the chilled glasses, beer season is upon us. While some 21st century patios allow us to enjoy them all year long, there’s nothing like drinking a cold beer in the warm sun. Like any neighborhood, the Upper East Side has a many great patios to enjoy this spring. Sip a pint of craft beer from a picnic table at The Jeffrey – you’ll feel like you’re in your friend’s backyard. For something a little classier, head to the Jones Wood Foundry, which boasts a quaint, ivy-filled courtyard apt to enjoy wines from around the globe. With its abundance of outdoor activities, it’s only natural that the Upper East Side comes to life when the sun comes out. If you’re prone to spring fever, Upper East Side condos might be for you. 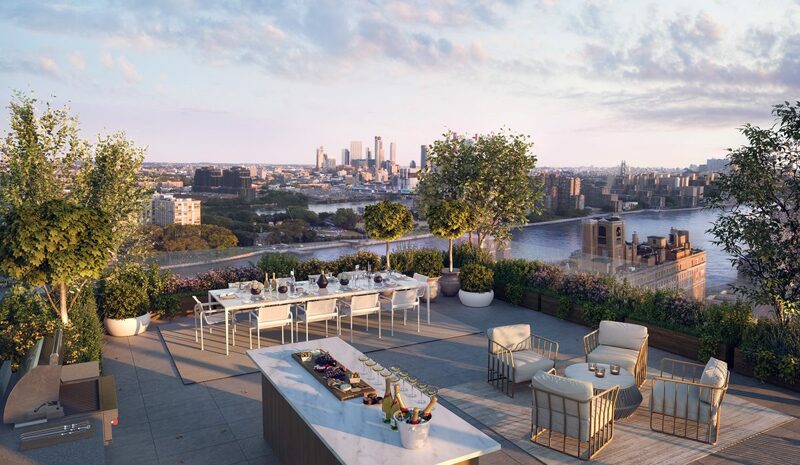 Browse our website to learn more about residences at 40 East End. Architecture in the Upper East Side, near our luxury New York condos, spans hundreds of years of styles and designs many of them preserved and restored today. This area of the city is known in particular for its urban residential architecture, including brownstone row houses, upscale townhouses and 20th century mansions. While the rest of the city is getting smaller and taller, the Upper East Side remains an emblem of its architectural history, an ode to the post-Civil War development that occurred in the area. New York City is known for its 19th-century brownstones – brick homes with a stone facing. The area around Upper East Side condominiums is home to a number of these characteristic buildings. Venture down 61st street to see these classic brownstones, some of them five storys tall. The Upper East Side is one of the few areas in New York City that still has large, pre-war residential buildings with high ceilings and arched windows. Due to their historic value, these buildings have been restored for years and years. The district has a number of townhouses that have also retained their original architecture, though most have been gutted and modernized. Head down Henderson Place, a quaint East River street just five short blocks north of 40 East End’s luxury New York condos, to view a row of 24 cherry-red brick townhouses that will take you back to an older, charming New York City. The Upper East Side has many mansions, some dating back hundreds of years. These mansions exude old-world charm, and are part of what give this opulent neighborhood its character. Journey east on 64th Street from Central Park to view some of these architectural wonders. Many of these mansions have been restored and added to, now housing world-renowned museums. The Frick and the Cooper-Hewitt Design Museum are just two examples. 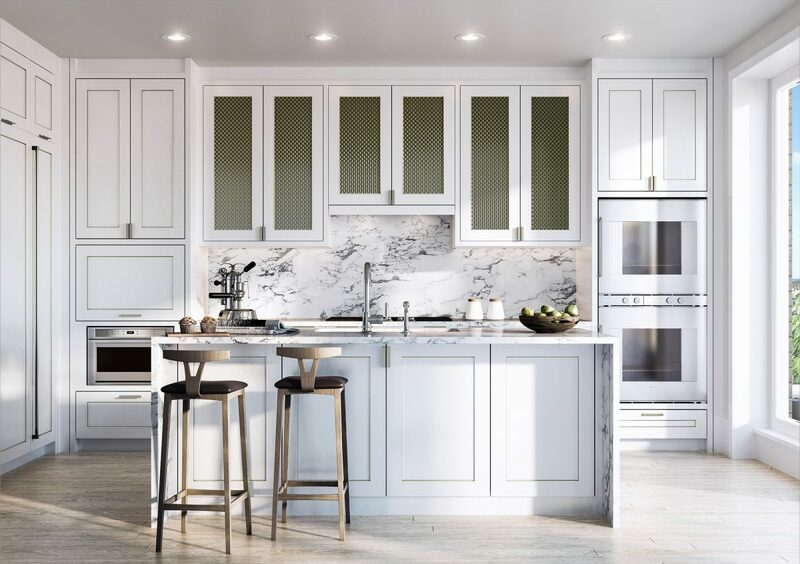 The boutique condominium building at 40 East End offers a modern take on the architectural traditions of the Upper East Side. The building’s façade is an ode to the brownstone houses New York City is known for. The large casement-style windows are common in 20th-century New York City mansions. 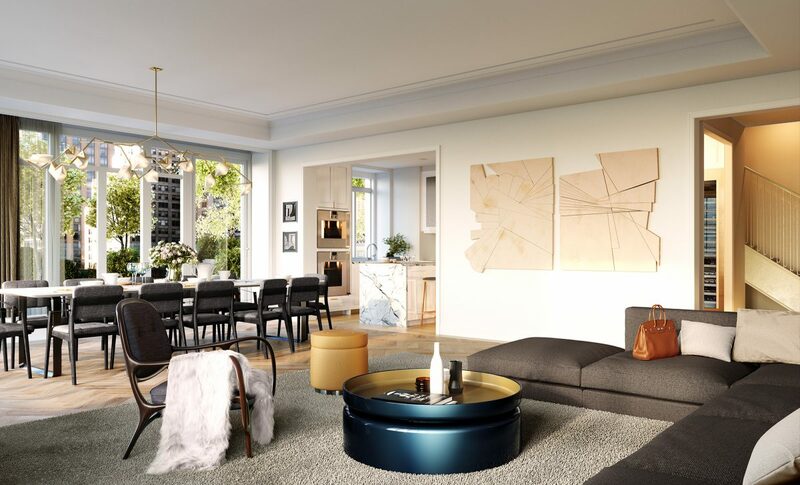 40 East End was designed to fit seamlessly with the architectural styles found in the Upper East Side. Our luxury New York condos contain all the amenities of a modern facility, paired with an exterior that reminds us of days gone by. To learn more about 40 East End’s architecture, design, and vision, go to 40eastend.com. The Upper East Side is home to a breadth of international eateries that are newer to the Manhattan restaurant scene. Looking for something a little different for your night out this weekend? Here are a few fantastic international restaurants a stone’s throw from our East Side condominiums at 40 East End. This Cambodian bistro is well-known across the city for upscale southeast Asian cuisine. Consider ordering the Khmer Fish Cakes, Phnom Penh Roast Duck or a chilled salad – you won’t be disappointed. Angkor has vegetarian options, a cozy outdoor terrace, and elegant modern ambience complete with Cambodian decor. This is a great place to visit before an event or after a night out at the theater. Here, you can get Mexican street food just three blocks from 40 East End. This is what life at East Side condominiums is like, quiet, tree-lined streets without sacrificing the variety and flavor of a big, international city. Cascabel Taqueria serves up authentic Mexican food, including tacos – try the carne asada, yellowfin tuna burritos, and barbecue chicken. Delivery, bottomless brunch drinks and outdoor seating make Cascabel a must-visit New York restaurant. Drunken Munkey’s dishes – referred to as Anglo-Indian cuisine – will take you back to India during the colonial period. This hybrid-style cuisine blends European cooking with Indian ingredients, offering upscale Indian food, inventive cocktails and attentive service for a complete dining experience. Masala Bombay lambchops, paneer tikka and shrimp curry are just a few of the recommended menu items. Fun, funky and cozy are three of the words used to describe Drunken Munkey – the perfect spot for date night. The heart-friendly Mediterranean diet, which involves lots of vegetables, whole grains and healthy fats, is not only a healthy choice, but a flavorful one, too. The menu at Beyoglu, an Upper East Side Turkish restaurant, is fresh and apt for sharing. Try the incredible hummus, kebabs served with yogurt or the mixed meat platter for unique international cuisine close East Side condominiums. This restaurant is located about halfway between 40 East End’s luxury Manhattan condos and the Metropolitan Museum of Art. Enjoy an afternoon at the Met and grab a bite to eat on your way back home. 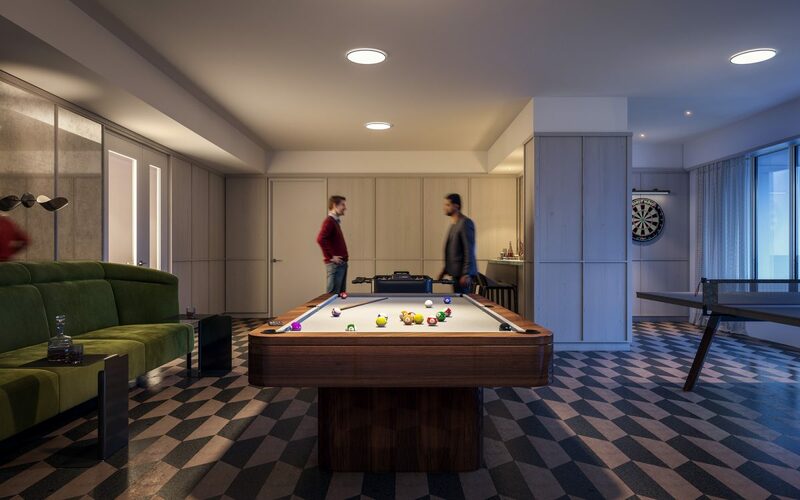 For more information on life at our East Side condominiums, from location to design to building amenities, browse our website at 40eastend.com. Whether for a weekend stay for a friend’s wedding, or a staycation with your special someone, the Upper East Side has a number of incredible boutique hotels to make any getaway or exploration of the nearby condominiums exceptional. These designer hotels offer a taste of classic luxury, a term that may be best embodied by this opulent neighborhood. Traditional 1900s architecture meets chic, modern décor and state-of-the-art amenities that will complete any New York City experience. Located less than 10 short styled blocks from 40 East End’s luxury New York City condominiums, these are the area’s most elegant hotels. Due west from our East Side condos is The Mark, one of the city’s landmark places to stay. Nearly 100 years old, this upscale hotel opened its doors in 1927. Stay here for the sophisticated design, central location, or the art. The Mark Collection includes many one-of-a-kind pieces created by renowned artists especially for the hotel. Expect contemporary details like heated towel racks, remoted controlled shades and lighting, and a daily delivery of The New York Times. In the evening, enjoy French-American fusion at the Mark Restaurant & Bar, a busy neighborhood locale. 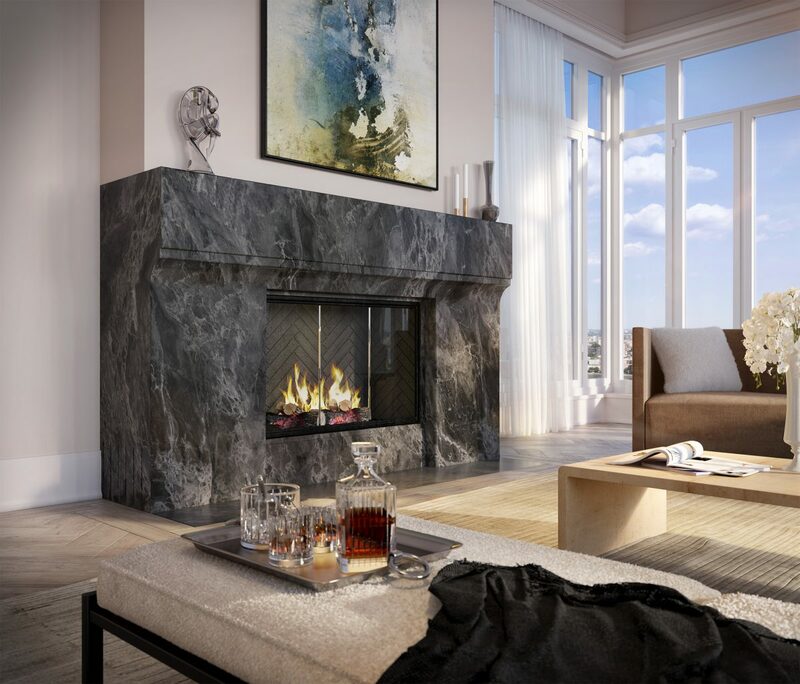 This luxurious hotel is exceptional in many ways – rooftop gardens, fireplaces, and a lavish spa are just a few of the reasons to book a suite at The Surrey. Built in the 1920s as a residence hotel, it has seen many famous faces over the years, including JFK and Betty Davis. The Surrey offers impeccable service and truly luxurious touches, from the mattress to the bedding to the white marble baths featured in some suites. The Cornelia Spa and the hotel’s French restaurant, Café Boulud, offer unparalleled relaxation without leaving the grounds. From the outside, it looks like a residential building inside, however, is another story altogether. Located off Madison Avenue on a tranquil street with plenty of tree shade, this stunning hotel is all about the details. The Lowell offers nearly 75 suites and deluxe rooms with amenities like full kitchens, private terraces, and beautiful sitting rooms. The Lowell offers personalized service to each guest, and the staff is attentive and mindful of guests’ needs. This hotel is a great place for a cozy winter getaway, as most suites feature a wood-burning fireplace. All in the heart of the Upper East Side, these three boutique hotels are sure to impress any visitors to New York City. 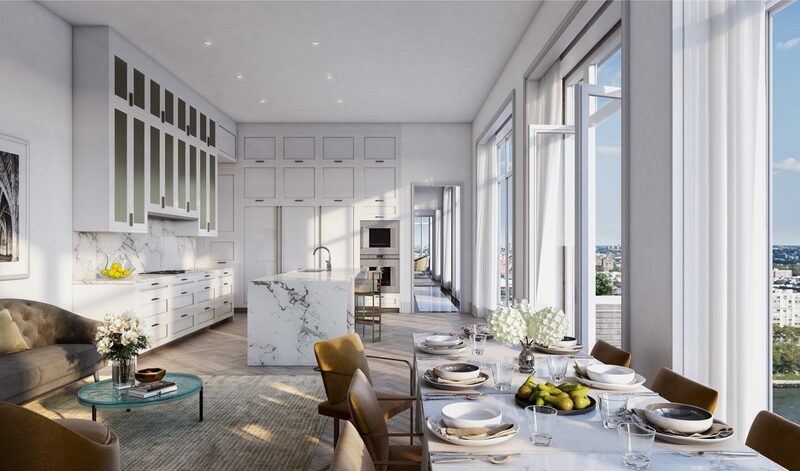 A short distance from luxury New York City condominiums at 40 East End, these accommodations combine convenience and indulgence and can serve as an ideal destination to explore what’s available in the Upper East Side for your next home. We get it, life can become really busy, and making a nutritious meal doesn’t always make the top of your list. Despite the state-of-the-art kitchens at our Upper East Side condos, everyone needs a night off. Rather than picking up pizza, try one of these eateries for a balanced, wholesome meal at the end of a long day. Considered one of the best vegan restaurants in the city, Candle 79 is far from salads and smoothies. Wild mushroom-butternut squash ravioli, coconut pad Thai and empanadas are just a few of the tasty starters. Meat-eaters and vegetarians alike will enjoy hearty, innovative dishes like Moroccan spiced chickpea cake and the eggplant parmesan. This restaurant also has an incredible brunch menu that comes with either green juice or a cocktail. Candle 79 is located on 79th Street at Lexington Avenue, less than 10 blocks from 40 East End Avenue. East Pole is a great example that healthy food entertains as much as it contributes to a healthy lifestyle. East Pole serves up sustainably-sourced meats and fish alongside distinct protein and greens. Try their Macro Bowl, a meal-sized dish of grains, vegetables, beans and other protein, or the wild boar pappardelle. 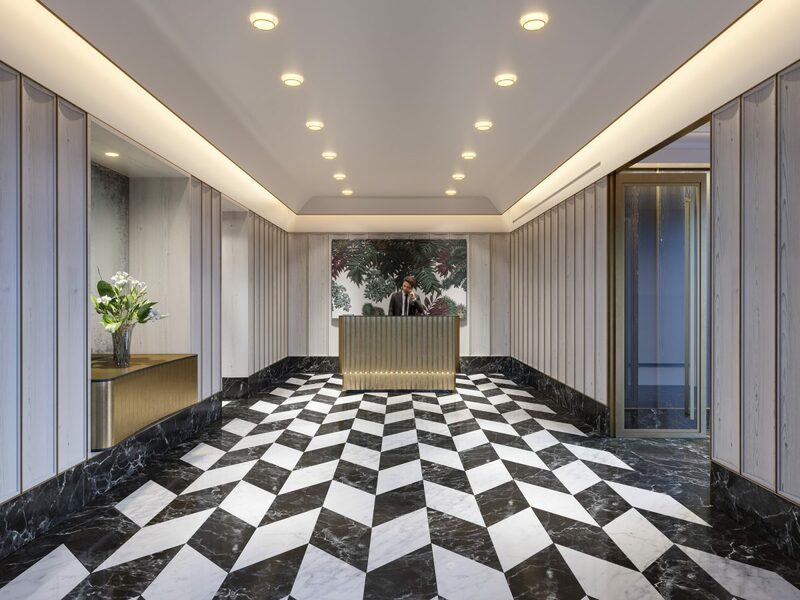 East Pole is located just two and a half blocks from 40 East End’s luxury New York City condominiums, at 65th Street and Lexington Avenue. Bareburger is a popular New York chain with two locations on the Upper East Side. Great for a quick bite or to take back to East Side condos, this burger bar is both healthy- and eco-conscious. Bareburger serves a range of organic burgers – beef, bison, turkey, sweet potato and black bean, among others. This juice and smoothie bar is located just four blocks from our luxury New York City condominiums at 40 East End – the perfect place to pick up vitamin-C-and-protein-heavy snack on your way home from work. Try one of their organic, cold-pressed juices or smoothie bowls, or choose to pick up a healthy soup to go. 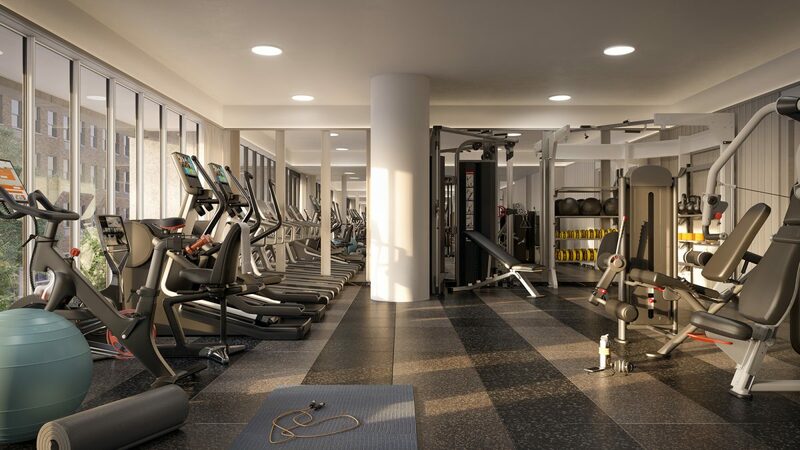 East Side condos are perfect for those who like to live a health-conscious lifestyle. The Upper East Side offers plenty of outdoor spaces for outdoor activity and great eateries for mindful consumption. To find out more about our neighborhood and how you can call it home, send us an email or pick up the phone today. Brunch is the 21st-century urbanite’s favorite meal of the week. Every Saturday and Sunday, groups line up for lovely afternoon of relaxing conversation over sumptuous cuisine. No matter how much you love to cook, you’ll want to take a break to explore the city’s booming brunch scene. Below are a few favorite brunch spots nearby our East Side condominiums at 40 East End. This innovative, Madison Avenue locale is a neighborhood favorite – and with good reason. Sarabeth’s is a posh, New York City chain that serves a delightful afternoon brunch though its relaxed indoor/outdoor style really brings it home at any hour of the day or night. Stop by Sarabeth’s between 8 a.m. to 4 p.m. on Saturday or Sunday for spectacular dishes. Lighter options include fruit bowls and souped-up steel-cut oats, with toppings like chia, blackberry and caramelized apple. Indulgent breakfasts include lemon & ricotta pancakes and a sweet-and-savory crispy potato waffle with chicken and apple sausage. Egg dishes feature scrambles, hashes and omelettes with innovative flavors. Pair your brunch with a flowery mimosa or their famous pickled Bloody Mary for the perfect weekend treat. The Writing Room is an eclectic, literary-inspired restaurant that aims to deliver a vintage feel. Subway tiles, vinyl flooring, studded leather seating, and shelves full of books are elements that make this spot unique. The brunch menu is chock-full of classic American cuisine. Traditional breakfast baked goods like coffee cake and banana bread are served alongside standard eggs-and-bacon dishes. Some of the more inventive plates include huevos rancheros, buttermilk fried chicken and house-cured salmon. Dubbed casual fine dining, The Writing Room is the perfect place for a cozy mid-morning meal this winter. Boqueria is an Upper East Side tapas restaurant known for small plates, paella and Spanish cheese and world famous Iberico ham. Named after a famous Barcelona market, this joint will transport diners to a much warmer climate. Boqueria is famous for its tapas-style brunch. They offer a prix-fixe menu with unlimited sangria and mimosa for $39 per person, as well as an a la carte menu. Try the Tortilla Española, a potato-and-onion omelette, caramelized french toast, or scramble of shrimp and peppers. Finish off the meal with an order of churros con chocolate. Boqueria is located just half a mile from luxury Manhattan condos at 40 East End – get there early to avoid inevitable line-ups. Our East Side condominiums offer residents the best of everything New York City has to offer: proximity to museums, abundant green space and excellent local eateries. Interested in moving to the Upper East Side? Learn more about available suites by contacting us today. Amidst New York City’s world-renowned art institutions are a few niche galleries – many of which pack in a great deal of history inside their walls. One of these is El Museo del Barrio, an Upper East Side gem that tells the stories of Latino Culture both in the U.S. and around the world. If you’re an art aficionado, you’ll love living in Upper East Side condominiums. Located just minutes from Museum Mile. Grab a coffee at one of the neighborhood cafes and head to El Museo del Barrio on a Saturday morning for an eye-opening experience. El Museo del Barrio is where art and culture intersect – expect to get a heavy dose of both. This museum is one of the city’s chief cultural institutions, featuring art collections and exhibits, as well as film, photography and performing arts. El Museo is home to 6,500 permanent exhibit objects spanning many cultures, and also plays host to a number of rotating exhibits. The permanent collection features modern and contemporary art, which includes paintings, photography; mixed-media graphics, which includes 4,000 prints from the 20th and 21st centuries; Pre-Columbian, archeological objects from the Caribbean and pieces associated with religious traditions like the Day of the Dead. This collection is full of carefully curated works that reflects identities and cultures of a diverse region. For those who enjoy powerful images, bright color and socio-political subtext, this is a great place to get some design inspiration for luxury New York condos. Side Park Café offers casual Latin American dining with an ever-changing menu. Dinner at Side Park includes a variety of tacos, enchiladas and cochinita pibil, seasoned slow-braised pork wrapped in banana leaves. Breakfast is served weekdays from 8 a.m. to 11 a.m. Enjoy one of their breakfast wraps, with scrambled eggs, and toppings like avocado, jalapeño and chorizo. Weekend brunch features a Mexican-style breakfast menu, as well as twists on American classics. El Museo is located along the stretch of Fifth Avenue dubbed Museum Mile across from Central Park, and is open from Wednesday to Sunday. The museum is located a short distance from our luxury New York Condos at 40 East End. Find out more about the neighborhood through or website, or call us today for more information. Known as one of the more famous streets in the world, Fifth Avenue is a hub for designer shops, museums and many popular attractions. 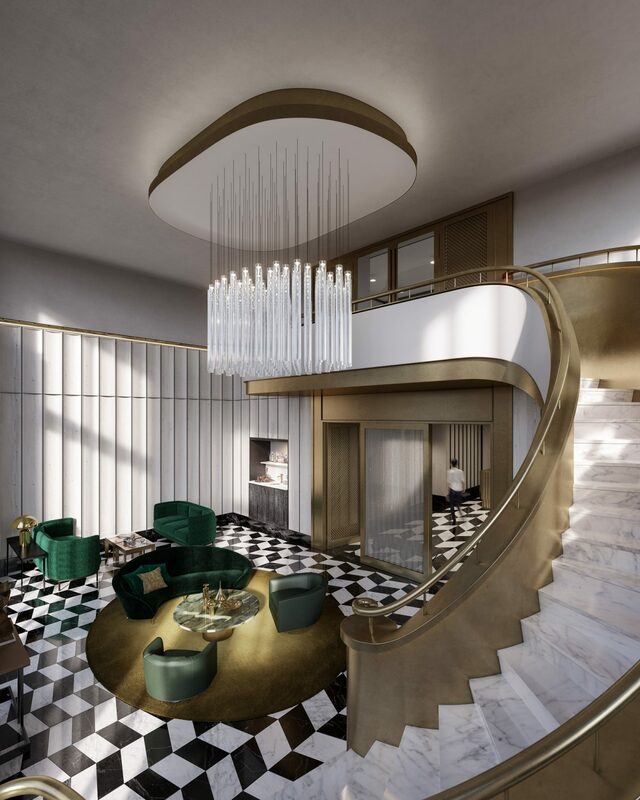 A major thoroughfare for the entire Upper East Side, you’ll get to know Fifth Avenue well while living in the Upper East Side condos at 40 East End. Just blocks from our luxury Manhattan condominiums, you’ll often find yourself visiting The Met with out-of-town friends or enjoying view of the park. Museum Mile dominates the section of Fifth Avenue that is parallel to Central Park, but if you head a little further south from Upper East Side condos, you’ll encounter some of the city’s best attractions and sights. Here are a few Fifth Avenue points of interest to do that don’t involve swiping your credit card or visiting a gallery. One of the more notable places of worship in the United States, this neo-gothic-style Roman Catholic church sits in the middle of the hustle and bustle of New York City. About five million people from around the world visit this church every year. Visitors are allowed inside during mass to experience the sober service in the foreground of colorful stained-glass. Head there on a weekend in the springtime, and you may get to witness a wedding. Throughout history, New York legends like Babe Ruth and Andy Warhol passed through these halls. This might be one of the most beautiful libraries in the country. The flagship branch of the NYPL library system, sits in a 100-year-old Beaux-Arts building across from Central Park. Grab a good book and sit in the Rose Reading Room, and you’ll feel like you’ve just arrived on a movie set. Even if you’re not a bookworm, it’s the perfect place to relax and enjoy one of the city’s many architectural wonders. After closing its Fifth Avenue doors a few years back, this toy giant has opened once again a half-block from the main drag. Kids will be greeted by a door person in full costume, as has always been the tradition, and then choose their own adventure. Go shopping at the FAO Mart, cause chemical reactions at the Discovery science station, or make their own race car – not to mention the famous dancing piano from the movie Big. Afterward, stop at the candy store, where you’ll find all kinds of sweets, both packaged and bulk. Fifth Avenue is an integral part of Upper East Side lifestyle. Our luxury Manhattan condominiums at 40 East End give you easy access to museums, shopping and many famous New York landmarks. For more information on life at 40 East End, click on Neighborhood on our website’s menu or contact us by phone or email.